As a young lad, I often spent my holidays at my grandparents house in Appleton Village, Widnes and just across the road was one of the entrances to Victoria Park, where I spent much of my time playing. 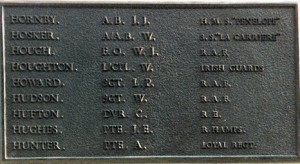 There was a war memorial in the park, listing the men who had lost their lives in various military campaigns and I remember seeing that a Houghton was on the list, but at the time I didn’t really give it much thought and it was only later in conversations with my grandmother that I discovered that he was actually one of the family. During one of these conversations, my grandmother revealed a fact that, she claimed, wasn’t widely known: Wilf was raised by his grandparents as their son. His mother was actually my grandmother’s sister-in-law, Charlotte Beatrice HOUGHTON, ‘Aunty Beattie’ as she was known. The story goes that Beattie and Wilf’s father wanted to marry but her parents wouldn’t allow it. This and Wilf’s untimely death were to have a profound effect on Beattie, as later events were to reveal. 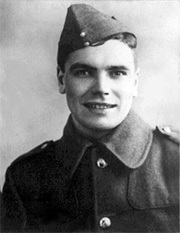 My grandmother didn’t know very much more about Wilf other than that he served in the Irish Guards and that he was killed in a tank in what she called the ‘Njimegen bridge disaster’ during World War II. It was some time before I browsed through a military history book to discover that the Irish Guards were involved in operation Market Garden in 1944, a campaign immortalised in Cornelius Ryan’s “A Bridge Too Far”. Many years later, after I became interested in family history, I tried to find out more about Wilf but struggled to know where to look. I was then fortunate enough to hear an article on BBC Radio 4 which announced that the Commonwealth War Graves Commission was making its database of those who were killed in service available for searching at its web site. My excitement at typing the website address into my web browser turned to disappointment when I found that the site was overwhelmed by visitors and remained so for several days. I eventually mananged to access to the search page and entered Wilf’s name into the form. After what seemed an age, I was presented with a page of W. Houghtons and scanning down the list I found an entry for a Lance Corporal in the 3rd Battalion Irish Guards, Service Number 2720034, who died on the 14 September 1944 aged 24. There was a link that took me to another page giving details of the cemetery location (Geel, Antwerp), grave number and a brief history of the fighting in that area. Now that I had Wilfred’s age and date of death, I arranged a visit to the library in St. Helens to use one of their microfilm readers to search their archives of local newspapers. It was not long before I found what I was looking for in the Widnes Weekly News: the front page for the 6th October 1945 issue was a list of casualties and there, alongside a picture of Wilf (unrecognisable due to the poor quality of the image), was a short article which revealed yet another sad aspect to the story: Wilfred’s wife Jean was told of his death on the day of the birth of their first child. The only thing that anyone in the family could remember about Jean was that she was from Scotland and that after Wilf’s death she moved back to be with her parents. 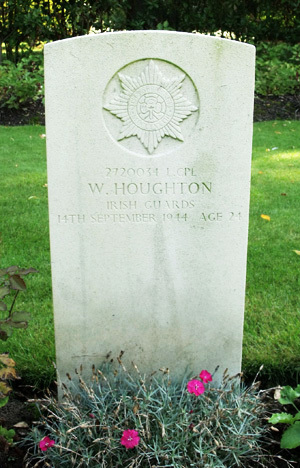 For many years, the story ended for me at this point, but while browsing on a genealogy surname list I chanced upon a post by someone looking for their grandfather, Wilfred HOUGHTON from Widnes who died aged 24 and was in the Irish Guards. I had found Wilfred’s grand-daughter! I have subsequently obtained Wilfred’s birth certificate, which confirms that his mother was [Charlotte] Beatrice HOUGHTON of 26 Foster St, Widnes with no father listed. 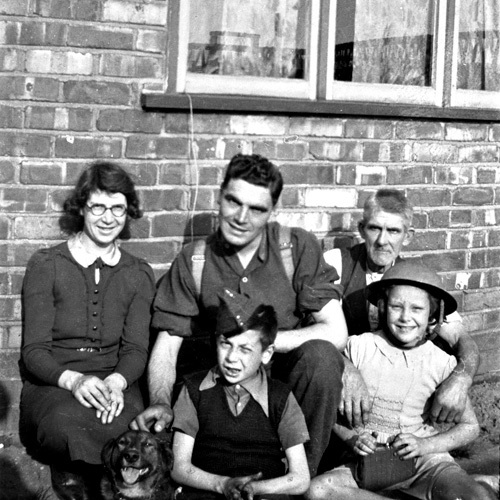 I also sent away for Wilfred’s marriage certificate which states that Wilfred HOUGHTON (engineers machineman, Irish Guards and a bachelor), from 365 Warrington Rd, Widnes married Jeanie Compston WILLIAMS (sewing machine factory machinist and spinster) of 34 Singer St, Clydebank in 1942. Jeanie’s parents were Thomas WILLIAMS (clerk, ordnance factory) and Agnes WILLIAMS, maiden surname DONALDSON. While sorting though a bag of family photos I found a negative which not only gives me another photograph of Wilfred but also has the only image I have of my great-grandfather Samuel HOUGHTON. The negative was in very good condition and I have been able to obtain a decent scan (reproduced above). 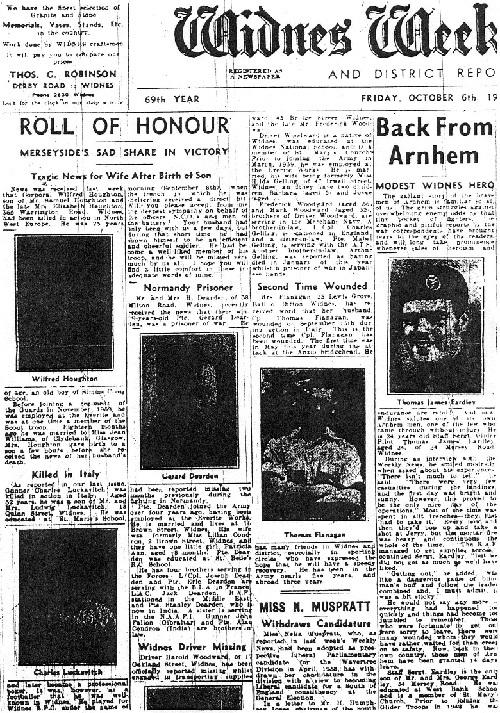 Another, earlier article in the Widnes Weekly News (22nd November 1941) is a birthday announcement for Wilfred along with an accompanying photograph (from which the portrait at the top of this page is taken). The text of the article reads: “Brothers in arms – Birthday Congratulations – Among the many Widnes families who have several members on service with H.M. Forces is that of Mr and Mrs S Houghton, of 365 Barrows Green Lane, who will have the joy on Sunday (November 24th) of celebrating the coming of age of one of their two sons, Guardsman Wilfred Houghton. His elder brother, Sergeant James Houghton is on service with the Military Police. Guardsman Houghton is in the Irish Guards. He joined up in January last year and was soon drafted to the B.E.F. He was safely evacuated from Bologne and is now on service in this country. He was educated at Simms Cross School and before enlisting was employed at the Everite Works of Messrs Turners Asbestos Cement Company. He was a member of the Everite Scouts. As stated he will be 21 years old on Sunday. Wilfred was killed three days before the start of Operation Market Garden, an audacious attempt by the Allies to capture and hold the bridges across the major rivers and canals in north west Europe so that they could gain entry to Germany from the north. The Bn left the conc area at la QUEUE d’HAYE (N.E. of VERNON) and motored all day, covering a distance of 60 miles. We harboured at 21:00 hours near FROISSY. No. 2 Coy went into a farm where Germans had left only that morning. A long day of movement still as reserve Bde. We travelled 70 miles and reached ARRAS as it was getting dark, to receive a great reception from the inhabitants. The harbour party left ARRAS to recce an area in the vicinity of DOUAI 6907. The Bn arrived and concentrated just NORTH of the town at 16:00 hrs. This had only been a short move of 12 miles. The Bn left DOUAI at 06:00 hrs, our object being BRUSSELS, via ORCHIES by-pass – TOURNAI – ATH – ENGHEIN – HAL. This was a distance of 80 miles but good progress was made once we got on the main road. We had a short and very bumpy trip across country and during this time crossed the BELGIAN frontier. As BELGIUM was entered the reception given us increased in enthusiasm – opposition was being by-passed all the time. For instance, there were several hundred Germans in ENGIENNCE and a battle raging with the MAQUIS as we went through. They could not understand why we did not stop but our orders were to push to BRUSSELS. At HAL about 18:00 hours, the C.O. held and O Gp for the entry into BRUSSELS. Our role with the 2nd Bn I.G. was to divert to the SOUTH and so up into BRUSSELS. Light was failing and it was very difficult to find our way through the suburbs, and progress was somewhat impeded by the enthusiasm of the civilians. As we were passing through a wood SOUTH of the city, a Spandau and A Tk gun opened up on the leading tps – an extraordinary contrast to what had been happening a few minutes before. It took a little time to clear up and then on we went again through cheering crowds and finally entered the AUDERGHEM district of the city about midnight. No 1 Coy was sent to take up a position covering one of the Eastern exits of BRUSSELS and No 2 Coy another one, whilst the remainder of the Bn were concentrated at important rd junctions just on the edge of the city. There was spasmodic firing throughout the night and No 1 Coy, whose position was just near the Airport (still in enemy hands) came in for a certain amount of mortaring. The Bn spent a quiet day in a pleasant area, with the exception of the Commanding Officer who staged a private battle near WATERLOO with a pl and a tp of tks who were compelled to withdraw in good order with the loss of one scout car. Cas for the day were one OR killed and nine Ors wounded. Bn moved its posn from the main shopping centre to a chateau belonging to King Leopold, which was kindly placed at our disposal by the local Mayor. 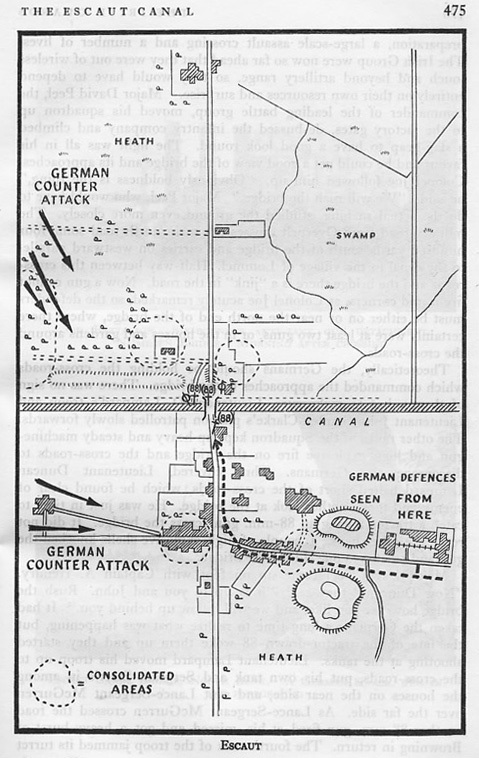 The Germans, as always, had left the house in some disorder, but no sooner had we put things straight that Orders Gp was summoned to Bde HQ and were told that the advance would be continued the following day to the line of ALBERT Canal. The only cas today was one OR wounded. We left BRUSSELS at 10:00 hrs amid the usual scenes of cheering and enthusiasm and move without incident through LOUVAIN as far as DIEST. 32 Gds Bde Gp was leading the advance with the I.G. Gp in reserve. On reaching the ALBERT Canal the W.G Gp found that all the bridges had been blown and we were compelled to halt whilst a bridge was constructed during the night. The only casualty during the day was one OR wounded. The Bn took over the Bridge head on the ALBERT Canal from the W.G. Group at noon. The day was an unpleasant one with considerable shelling from enemy S.P. guns which caused several casualties. Capt. W.R.R..S. BRUCE was killed early in the day and Capt.. WHITE and LORD PLUNKETT wounded. In the early evening, No 3 Coy (Major M.V. DUDLEY) carried out a sweep in co-operation with a sqn of tks to clear the Germans from a slag heap to the WEST of the town which was dominating the bridge head. The attack met with considerable success but was unable completely to clear the large factory area and had to be content with limited consolidation. Several S.P. guns were knocked out and from this moment, the shelling of the bridge head diminished considerably. Total OR cas for the day were 8 killed and 16 wounded. The Bn remained in the bridge head until 17:30 hours when the town was handed over to 11 ARMD DIV. In an unfortunate concentration of mortar fire during the morning, Capt. R.B.H. INGLEBY, Capt. G.A. JEFFRIES and Lt. M. AIRD were all wounded [“Lt Aird was peppered with shrapnel wounds”] – so the Bn was getting very short of officers. In the evening, the group moved up to HALCHTEREN and reached the town just as darkness was falling. A sqn and coy of the W.G. group were in possession but had been unable to clear up the local German resistance outside the town. We were therefore compelled to do a night clearing which proved eminently satisfactory and the W.G. moved on to join the remainder of their group. O.R. cas for the day totalled one killed and 8 wounded. The Bn left to join the W.G. group in the woods to the EAST of HECHTEL. In the village itself the W.G. had met considerable opposition and towards evening were compelled to withdraw from it altogether. The Bn was ordered to by-pass the village on the following day and push N.W. towards the ESCAUT Canal. With this in view, the Bn harboured the night in the woods ready to move on next morning. O.R. cas for the day were 5 killed and 10 wounded. As is often the case, the 1/50000 scale map bore no resemblance to the ground and after one coy and one sqn had been launched on the chosen axis it was proved that the going was entirely unsuitable to tks. Luckily, No 4 Coy, which had been sent forward for this task pf ground recce were able to disengage from the enemy with very light cas and the Bn group followed up the C.L. of the GREN GDS group who had discovered a bridge by means of which tks could cross the otherwise impassable ground. Having reached the main rd to the ESCAUT Canal, the I.G. group were ordered to hook right and make for the bridge over the ESCAUT at de GROOT BARRIER. During the approach march we met no opposition and civilians and elements of H.C.R infmd us that there were no enemy SOUTH of the Canal. We reached the area of the bridge as light was failing and the Commanding Officer, after a rapid recce, decided to try and rush it. No. 2 Coy and one sqn of tanks were detailed for the job. The tks put down a hail of fire on the area of the bridge itself and succeeded in knocking out several un-armed 88 mm AA/A. Tk guns. Lt. STANLEY-CLARKE’s pl. preceded by a tp of tks then rushed the bridge itself and succeeded in reaching the opposite side. The remainder of No. 2 Coy and No. 3 Coy were quickly pushed across to join them and the posn was rapidly consolidated. The RE Offr with the Bn succeeded in disconnecting all the charges which were in position to blow the bridge, and the crossing of the ESCAUT had been successfully achieved. Total cas for the day were one OR killed and 5 Ors wounded. At about 09:00 hrs, the posn S.W. of the Bridge was counter-attacked by a mixed group of S.P. guns and inf who were trying to get back across the canal. At one time, one of the S.P. guns was within 100 yds of Bn. HQ but the posn was quickly restored and the enemy driven off with heavy losses. During the attack, Capt. E.E. RAWLENCE (M.T. Offr) was unfortunately killed whilst trying to stalk a S.P. gun with a PIAT. The RSM also was evacuated suffering from blast and burns about the face and eyes. The C.O.’s staff car and several other vehicles were wrecked by enemy shell fire. The total O.R. cas were three killed and 10 wounded. A quiet day was spent by the Bn in rest and maintenance, and received a visit from the Corps Comd (Lt. Gen. HORROCKS) to congratulate those concerned in the capture of the bridge over the ESCAUT Canal, which had already been christened and signposted “JOE‘s BRIDGE” in honour of the C.O. The only cas suffered today was one OR wounded. The Bn was ordered to move into the Woods N.W. of the bridge head to enlarge it and took up a defensive position in this area during the afternoon. An enemy counter-attack was launched in some strength against the bridge head. A number of the enemy with spandaus and bazookas succeeded in infiltrating into the area held by No 3 Coy on the left, and the whole Bn and the bridge itself were subjected to fairly heavy mortar and shell fire throughout the day. During the evening , although the attack had by then been halted, we were compelled to re-organise to closer dispositions that those we had previously held. At nightfall, the shell and mortar fire intensified and was subsequently proved to be a cover for the enemy’s withdrawal, as there were no signs of them the following morning. During the day, Lt. KENNARD and six ORs were killed, 23 ORs wounded and five ORs missing, but on the whole, casualties were lighter than might have been expected as the result of a two Bn co-ordinated attack. A Bn of the HAMPSHIRE REGT took over our posn during the morning and the Bn moved SOUTH of the Canal to the area of OVERPELT for a short rest and an opportunity to maintain the vehs, which after the long advances of the past few days were badly in need of attention. Today’s casualties were one OR wounded and five ORs missing. A quiet day in the concentration area. It was decided as result of casualties and lack of reinforcements, to re-organise the Bn temporarily on a three coy basis and to this end, Major M.V. DUDLEY and his Coy HQ were for the time being L.O.B. During the evening an O Gp was held at 5 BDE HQ, under whose command the I.G. group now came, and orders were issued for a break-out of the bridge head on the following day and an advance NORTH to the ZUYDER ZEE. Today’s casualties were one OR killed and one OR wounded. The I.G. group was to lead the 5 BDE and effect the initial break-out of the bridge head. We had in support of us, 10 Fd Regts RA, 2 Med Regts RA and one heavy battery RA, and the call on a cab rank of 11 Sqns of TYPHOONS. The Bn Group crossed the Div S.L. behind a rolling barrage, but we had not gone far before the leading sqn was halted by enemy battle groups with 88 mm guns and spandaus in the woods which flanked the roads. Progress was then slow, but the Typhoons who made 200 sorties during the afternoon, were able to overcome the enemy opposition, and after taking approx 100 PWs we crossed a small bridge just SOUTH of VALKENSWAARD in the evening and entered the town just as night fell. During the day, Lt. RUSSELL was wounded by an enemy sniper, and seven ORs were killed and 18 wounded. After a quiet night, we were due to resume the advance early, but were delayed by the inf Bn of 50 DIV which was to take over form us and did not arrive until about 09:00 hrs. However, we got under way again and advanced along the C.L. as far as AALST where again we encountered a nest of A Tk and MG posts in concrete emplacements supported by inf. Unfortunately, owing to bad weather, we were unable to obtain air support but the gunners did good work and at 17:00 hours the enemy decided to withdraw after destroying their weapons, and we were able to have a clear run through EINDHOVEN 4219 to the WILHELMINA Canal. Here we found tps of a U.S. AIRBORNE DIV who were guarding the canal where the Germans had blown the bridge. The Bn group accordingly harboured the night SOUTH of the canal, during which time an excellent bridge was constructed by the REs. The GREN GDS Group took over the lead and the advance continued along the axis via ST. OEDENRODE 4232 – UDEN 5342 – GRAVE 6253 – MALDEN 7055. Several bridges along this route had been captured by the paratps and only one diversion having to be made owing to the bridge having been blown by the enemy. On the outskirts of NIJMEGEN 7162 however, it was discovered that the enemy were still in possession of the centre of the town, and the bridges, though intact, had not been captured between the GREN GDS Gp and the enemy and we succeeded in advancing as far as the main POST OFFICE, but not in reaching the river which was protected by well sited forts and emplacements. Accordingly, the Bn group was ordered to harbour in the area of MALDEN 7055 until the situation cleared. The only casualty today was one OR killed. During the day, heavy street fighting again continued in the town and in the afternoon and American Paratp Bde, supported by tks of 2 (Armd) IG were able to effect a daylight crossing of the river WEST of the town. Although they suffered heavy casualties on the water, they were able to make their way to the NORTH end of the rly bridge and support the GREN GDS group who were bale, with this assistance, to capture both the vital bridges intact. As darkness fell, the Bn group moved forward to harbour the night on the NORTH bank of the R. WAAL protecting the road bridge from counter-attack. The only casualty today was one OR wounded. The advance was resumed at mid-day, but stiff opposition was encountered soon after leaving the outskirts of the town, which later proved to be thick screens of some 7 x 7.5 cm and 2x 8.8 cm Assault Guns, supported by inf who lined the ditches with spandaus and squeeze guns. The I.G. group were again in the lead, but the country was totally unsuitable for the employment of armour as the main road was embanked and the country on either side of it dyked and impassable to tks. Lacking the support of Typhoons, the Bn was unable to advance and was compelled to form a tight laager for the night in its present posn area 702662. During the day, LTS. 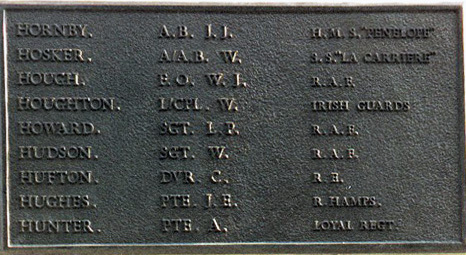 WILSON and GORDON – SHEA were wounded, which left the Bn with only two Pl Comds, and one OR was killed and 17 wounded. It was decided that the axis should now be cleared by elements of 43 DIV and accordingly the Bn group was ordered to remain where it was until this operation was completed. During the day, there was a certain amount of shelling in the Bn area as a result of which, a house in which Bn HQ was situated, was unfortunately burnt to the ground. Capt. G.S. CORBETT was wounded by a shell splinter, six ORs were killed, 21 wounded and one missing. The Bn was still holding their positions on the main road NIJMEGEN – ARNHEM while 43 DIV endeavoured to clear the C.L. There was some air activity towards evening and the bridge over the R. WAAL was subjected to constant shelling and air attack. Behind us, the C.L. had been cut by a German battle group and was making supplies of ammunition and petrol an anxious matter. The C.L. behind us was temporarily cleared of the enemy and Bn. H.Q. moved into the HUIS von OOSTERHOUT 694657 – a very comfortable chateau just WEST of the C.L. At last we received some reinforcements – 70 men with Lts. REYNOLDS, GALLOWAY, MORRISEY, and WARNOCK. An uneventful day spent in rest and maintenance in the conc. area. The Bn group was moved into 30 CORPS reserve with the task of counter attacking any enemy threats to the now enlarged bridge head. To this end, the group was divided into 3 columns – one at 1 hr, one at 2 hrs, and one at 4 hrs notice. It is expected that we shall not again be committed to action before a bridge head over the R. NEDERIJN has been established and consolidated by 42 DIV. A day of peace and quiet. The Bn received orders to move into a defensive posn in the area of AAM 7170 to relieve 1WG. We had one sqn of 2 (Armd) IG tks in support and the take over was completed by 18:00 hrs. During the night, heavy mortar fire fell on No. 4 Coy area and 5ORs were killed and 5 wounded. Otherwise the day was uneventful. Patrols were sent out to recce the ground to the NORTH of the Bn posn but found no enemy. We also made contact with 7 GREEN HOWARDS on our Eastern flank. Very little happened on the Bde front today and the enemy seemed to have withdrawn slightly from their posns, Patrolling was carried out as on the previous evening and no enemy were found. After a peaceful night the morning was spent in laying defensive mine belts and harassing the enemy with mortar and M.G. fire. In the afternoon, Major FITZGERALD (2 i/c) was ordered to recce a new concentration area N.W. of GRAVE 6253. 6 Offrs and 155 ORs arrived as rfts. Patrolling was again carried out during the night and proved to be uneventful. Ten ORs were wounded during the day. The less fortunate and more tired 3rd Battalion remained in the bridgehead for more fighting. 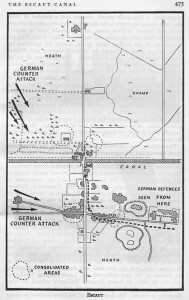 Early on the morning of the 14th [September] the Germans launched two battalions in a heavily supported counter-attack. The weight of it fell on No. 3 Company on the left flank. Waves of Germans seeped through the thick woods and scrub, firing bazookas as they came and setting up Spandaus beneath the trees. They surrounded first the forward section and then the whole of Lieutenant H. KENNARD’s platoon; the fighting degenerated into savage slaughter among the bushes. Humphrey KENNARD was killed leaping from bush to bush. In such fighting weight of numbers was bound to prevail, and the platoon would inevitably be swamped if it were not reinforced or extricated. Captain Michael DUDLEY, the Company Commander, wanted to send up a tank, but the platoon was half a mile away through tangled, enemy-infested wood. Guardsman MOYNIHAN, the Company runner, said he knew the best way. Walking through the rides, he led the tank up to the platoon, reported back to Captain DUDLEY, and then returned again to withdraw the platoon. He brought back the survivors without losing a single man on the journey. The fighting continued all day, and all day the wood and the bridge were heavily shelled and mortared. During the afternoon the Company launched an attack to regain the lost ground. The Guardsmen scrambled through the undergrowth, shooting and grinding their way forward. Sergeant McELROY led his platoon, shouting encouragement to his section commanders and bayoneting the Germans. A bullet struck him in the foot, but he charged on, leaving a trail of blood on the dead leaves. They retook the position and threw the Germans out of their old trenches. When Captain DUDLEY came up to see the platoon he found Sergeant McELROY hobbling around, a boot on one foot and a shell dressing on the other. Captain DUDLEY took him back protesting to Company H.Q. and told him to go to the R.A.P. Sergeant McELROY went down the path, but turned back into the wood, and was back with his platoon when Captain DUDLEY returned there. This time he had to be forcibly evacuated with a reliable guard.